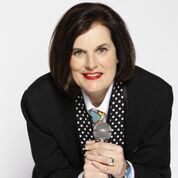 Paula Poundstone is a humorist, author and comedian known for her clever, observational humor and spontaneous wit. When she isn't collecting hotel soaps while on tour or panel-ing on NPR's #1 show, Wait, Wait...Don't Tell Me!, Paula hosts the popular Maximum Fun podcast, Nobody Listens to Paula Poundstone. Nobody is a comedy field guide to life complete with taste tests, cats of the weeks and leading experts in everything from beekeeping to ping pong to prosopagnosia (say that 3 times fast). Paula's stand-up credentials are endless: Cats, Cops and Stuff; Goes to Harvard; Look What the Cat Dragged In; and numerous television appearances including The Late Show with Stephen Colbert, Last Call with Carson Daly and Late Show with David Letterman. Famously, Paula provided backstage commentary during the 1992 presidential election on The Tonight Show with Jay Leno and was the first woman to host the White House Correspondents' Dinner. In 2017, Paula released her second book, The Totally Unscientific Study Of The Search For Human Happiness, in which she offers herself up as a guinea pig in a series of thoroughly unscientific experiments. Kirkus Reviews called the book, "A Deeply revealing memoir in which the pathos doesn't kill the humor - delivers more than it promises." The book debuted at #1 on the Amazon Bestsellers List in Humor, and the audiobook was one of the five finalists for the Thurber Prize for American Humor, the highest recognition of the art of humor writing in the United States. Paula can be heard on the big screen as "Forgetter Paula" in Disney/Pixar's Inside Out, winner of the 2017 Academy Award for Best Animated Feature Film. She has also starred in her own series on both HBO and ABC, is included on Comedy Central's Top 100 Comics of All Time and won an American Comedy Award for Best Female Stand-Up. In February 2019, Paula's stand-up special, Cats, Cops and Stuff was named by TIME Magazine and Tig Notaro as one of the 5 funniest Stand-up Specials Ever. Paula resides in Santa Monica, CA, where you can find her cleaning the litterboxes of her 15 cats: Clue, Oreo, Luigi, Jem, Belle, Brittle, Mrs. Feziwig, Wednesday, Severus,. Tonks, Theo, Sham Wow, Harrison and Hardy.